This bottle of Mojave Mystic Mauve is dried and cakey at the top, lots of little dried chunks fall inside so my nails are a little bumpy. Then I noticed the angle and lighting in my pictures hid the bumps, yay for me! Now the name says mauve, but it's really toned down with some grey and it has tons of bright pink and purple shimmer. It looks like yet another drab work-appropriate color I've chosen, but the unexpected funky shimmer makes it so fun! Should definitely click the picture to see the shimmer. I used 2 coats with OPI Rapid Dry topcoat. I think this topcoat does an ok job of drying quick but as I type this I have already messed up my left index finger. It's been hours since I painted my nails, bleh. I did a blue french with some polish from Wet Seal, this is the only bottle I own from there and it's all right application wise. The color is nice though. It was boring-looking so I was just playing around with some acrylic paint but thought I'd show you. I started with my pinky so by the time I got to the index finger it turned out ok lol. I forgot to take pictures of my right hand aaah. Look at those stains! My left hand is really bad. Wow, your nail art is amazing. I can't do anything like that! So jealous! You could probably get a lot of money for that type of thing! I love the funky blue french! So pretty! The Opi is a nice one too. Like you said,good for work. I love the blue flowers you painted! They're so pretty. I love the purplish-grayed color and your nail art is sooooooo cool. Love it! Thanks, I'm terrible with tutorials! Basically tho I put a dollop of blue paint next a dollop of white and dipped my brush into both and just swooshes them in a direction. Thanks, I was just messing around with the paint lol. 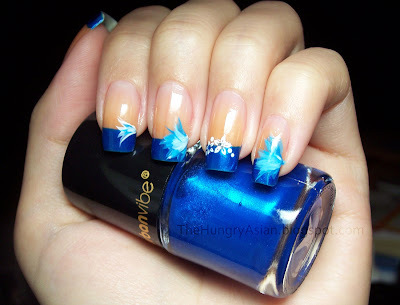 I love the blue polish with the designs. My friends keep telling me to do more "grown up" designs like yours....really cute. Thanks! I like all your designs you should do whatever you want! I agree - I both like the base color - it makes your nails look so clean and finished! - and the nail art. I especially like that you didn't do the same thing on every nail, but something similar. A gorgeous effect! The blue funky french, and that design on it - unbelievable! How can you make such a design? It's absolutely amazing! Thanks! It was very easy, dip paintbrush into blue then white paint, and just brush anywhere! very nice work on the painting. You do so great with that! Love the OPI shade. On your nails everything looks beautiful. Your art work is superb! Love that shade of blue. If you have any questions, comments or requests feel free to send me an email. OPI Can You Tapas This? Copyright © The Hungry Asian. All rights reserved.